How did you fill in the blank? Yet, each answer was missing something that I believe to be vital to organizational success. The most important job of a leader is to assure maximum results through creating an environment where every individual is contributing at their full potential and everyone is pulling together towards a common purpose. A team will achieve maximum results when every single person is contributing at their full potential and all team members are pulling in the same direction. Imagine a team of horses that are not tethered together trying to pull a heavy wagon. One side of the team is pulling off to the left and the other is pulling off to the right. You get the picture. 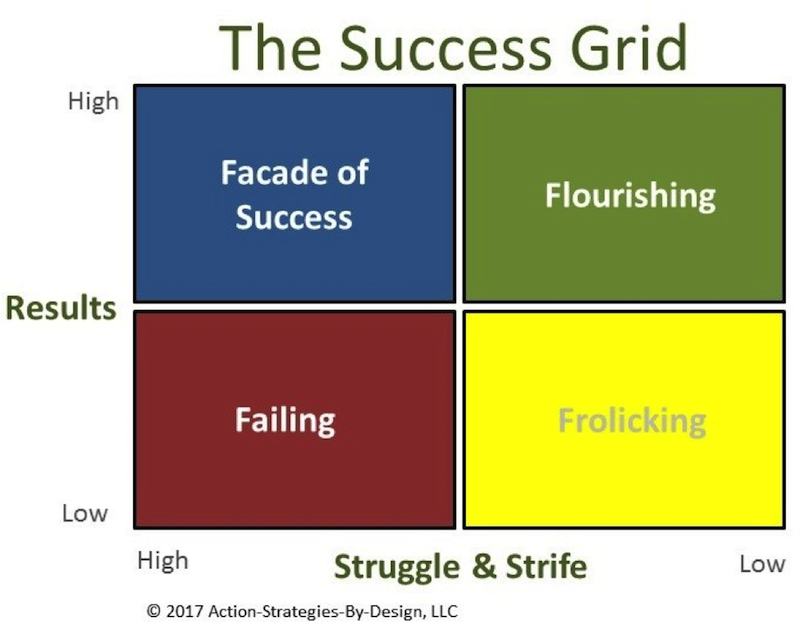 The Success Grid describes four types of organizational environments: Failing; Frolicking; Façade of Success; and Flourishing. Only one of these environments supports sustained results and maximum success. Take a look at our Success Grid. At first glance both the “Flourishing” and “Facade of Success” quadrants look pretty good; “Results” are high — what more could you ask for? Yet, the “Facade of Success” is the most dangerous quadrant for an organization to operate in. Sure, the team is achieving results, but at what cost? How long can it sustain success in an environment of high stress and toxicity? The answer is: not long. People cannot contribute at their fullest potential in an environment where there is toxic stress. Even more, it might not take long for teamwork to give way to finger-pointing and blame. Here’s a very simplistic explanation of why. There are times when we are in an environment where we are under a significant amount of negative stress and lack a sense of psychological safety. In this state, we are primarily operating from our primitive brain with the amygdala in charge. This part of our brain cannot be creative, innovative or problem solve. All it can do is fight, flee, freeze or appease. Creativity, innovation and problem solving require that we operate from our executive brain or prefrontal cortex. We cannot operate from both at the same time. No matter how successful things may appear, when there is high stress that creates a toxic environment, your people are not contributing at their fullest potential. And, results are left on the table. Establish a clear vision and strategy, and 1-3 distinct priorities for achieving that vision. Get to know your team members, their goals, aspirations, strengths and weaknesses; then, set clear expectations and hold everyone accountable. Build alignment around your vision by being willing to engage in dialogue and debate around ideas, issues and conflict. Develop, implement and maintain the systems and processes that support your people in contributing their utmost. Create a culture of psychological safety and trust where leaders encourage team members to be creative, express their opinions, ask questions and respectfully disagree. In which quadrant is your organization currently operating? If your answer is anything other than Flourishing, I can help your team achieve improve results with less struggle and stress. How can you move your organization to the flourishing quadrant? Let’s schedule a time to talk. Is Your Organization Operating in the "Facade of Success?" Is your team really successful? Or is it just a façade? Find out here what the difference is and see how organizations achieve true success. Productive Conflict: Oxymoron or Competitive Edge? Who Holds the Solution: Is It the Team, Leader, Or Both? As A Leader, Where’s Your Focus? TAGGED : 4 quadrants of results for work place teams, how teams work in the facade of success, how to achieve sustained results in the Flourishing success quadrant at work, The Facade of Success, the Success Grid, which success quadrant is your work team in?